La lot (wild betel leaf (piper sarmentosum)) is a bushy carminative plant, helping to cure dysentery or to ease toothaches. It should not be confused with la trau (Vietnamese betel leaves (piper betle)), a climbing vine, which is often chewed with the areca or betel nut and lime. Chewing releases dark red juices which stains teeth and lips. These days in Vietnam, few people except for the elderly eat trau cau. Although you'll sometimes see the betel leaf and areca nut at engagement and wedding ceremonies to signify love and fidelity. To find out why, you can read the Vietnamese folktale of the betel leaf and areca nut. 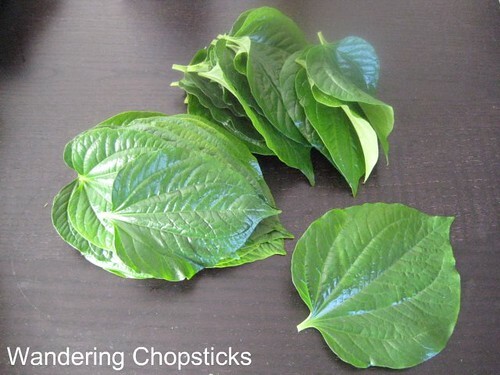 Anyway, back to the wild betel leaf. La lot is often cooked wrapped around minced beef as it is incredibly fragrant when grilled or pan-fried. I keep the seasonings pretty simple as the herb adds so much flavor on its own. I'm lucky that my youngest uncle grows la lot, but you can find them in most Asian grocery stores. This dish is popular as part of many Vietnamese restaurants' bo 7 mon (7 courses of beef). 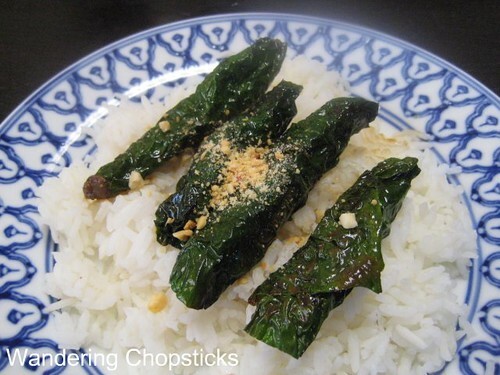 Serve with Mam Nem (Vietnamese Fermented Anchovy Sauce) for dipping. 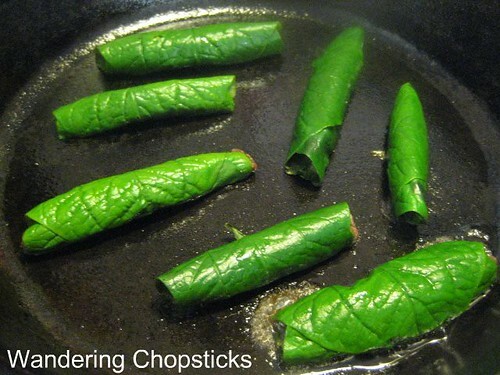 These herb wraps may be simply eaten with rice, or wrapped in rice paper. Optional: Instead of 5-spice powder, you can substitute with curry powder. Instead of ground beef, you can use thinly sliced beef and marinate as usual. Pluck and wash la lot. Set aside. I prefer making my own ground beef for this because it's less fatty, but packaged will work as well. Adding a little bit of pork provides juiciness as I find beef sometimes dry. After grinding your own meat in a food processor, add 1/2 tsp salt, 1 tblsp soy sauce, and 1 1/2 tsp Chinese 5-spice powder. Mix thoroughly. Pop a little bit of the meat into the microwave for about 30 seconds or so to cook. Taste. Adjust seasonings if necessary. I re-did the photos for this post and used sliced beef. Minced or sliced beef both work. 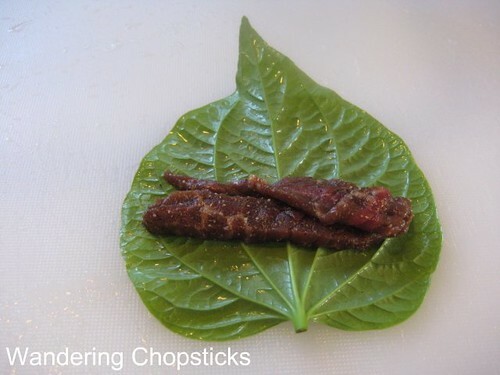 Place a small spoonful of meat on each leaf and roll. 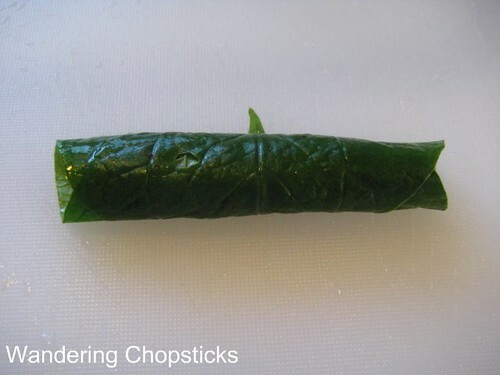 If you don't want to waste the little leaves, I put them in the middle of a larger leaf and roll. 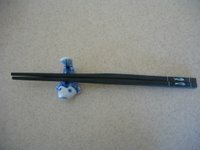 Place the wrap folded side down. The leaves will start to wilt and the most intoxicating fragrance will be released. These are incredibly addicting! Serve with rice or with a plate of herbs and rice paper, and Mam Nem for dipping. 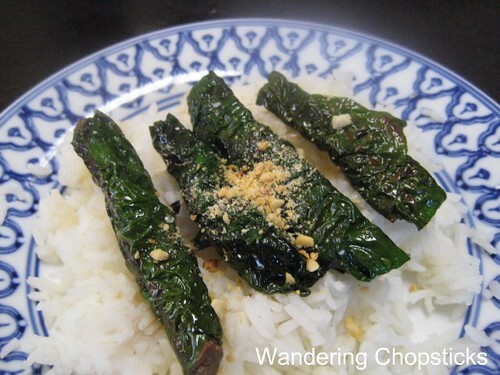 If you have a bunch of leaves left over, you can make Bo Xao La Lot (Vietnamese Sauteed Beef with Wild Betel Leaves). I'm submitting this recipe to Weekend Herb Blogging, a world-wide food blogging event created by Kalyn's Kitchen celebrating herbs, vegetables, or flowers. WHB is hosted this week by Kalyn's Kitchen. 1 year ago today, I could not finish the tooth-achingly sweet cakes from Porto's Bakery - Glendale. Wow, I wish I could taste this. I've heard of this leaf, but I'm pretty sure I haven't tasted it. Everything about this sounds just delicious. A very interesting post. You never cease to amaze me. Thank you for all of your heartwarming Vietnamese recipes. Can I drop in unexpectedly someday during dinner if I am ever in the Southern California area? Wow, these look and sound great! Can you get the leaf at 99Ranch? Are they ok to serve room temp or are they best hot off the grill? Seems like a great party app. Girl, you made all the dishes that my mom makes for me when I come home on holidays! Despite hearing about frog fallopian tubes (do frogs get pelvic inflammatory disease? things that make you go hmmmm...), that restaurant sounds good. I like what you ordered. you turned me into a betel leaf addict. mmmmmmmm. Mmmm - something else I haven't tried but it looks good! Wish I could smell them cooking! I grew up with these plants when I was little living in kampong still, I didn't even know these leaves are edible. Hmm... I will have to check out the local Asian store next time. 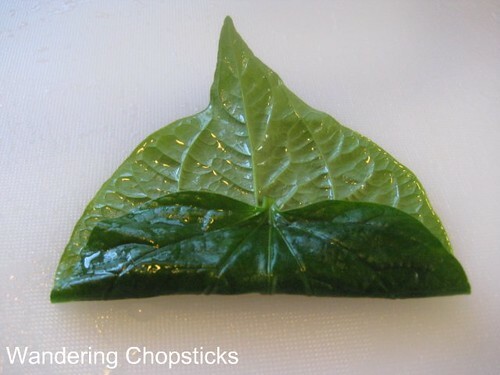 when i was a kid..i often see my grandma chewing these leaves..although i have seen them a lot of times in markets in japan i never tasted them..this recipe you made looks absolutely delicious!! 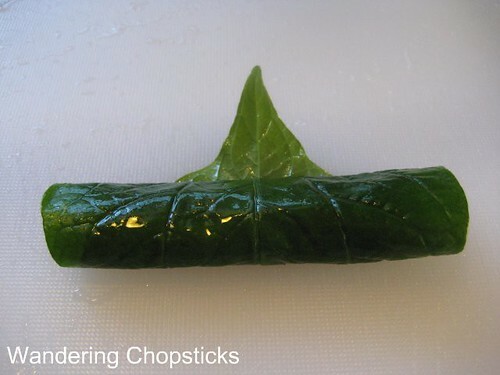 would want to try this recipe but maybe i can use other leaves?? what do you think?..its kinda hard to find them here from where i live..
oops i forgot to wish you happy new year and more blessings and more delicious culinary adventures for year 2008!! oh i miss 7 courses of beef. i'll have to have my own feast at home. no restaurant in town serves it! Looks beautiful, WC. I remember my grandmother chewing on trau cau. Seems like a million years ago. I didn't know la lot was so touching. :P But yes, hopefully we can meet up at some point. They're best hot off the grill because the aroma wouldn't be as strong if they're cold. I'm not sure if 99 Ranch would stock them, Vietnamese grocery stores are more likely to have them though. Did you look that up or are you a doctor too? And you brought up your mama! I don't want a mama's boy! Too bad we don't have scratch and sniff on the internet. :) It's so hard to describe what they smell like. Hmm. What did you use the plants for then? Hopefully you're not confusing it with the other betel leaf. 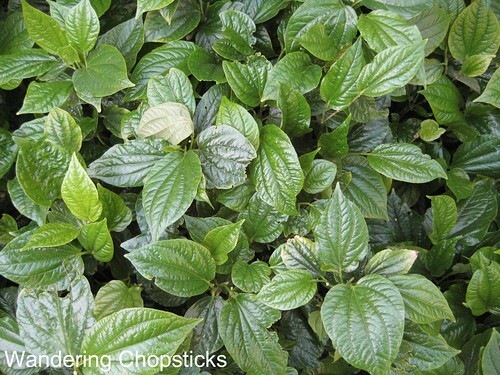 Your grandmother was probably chewing betel leaves, these are wild betel leaves. Not the same thing although they look similar. You can try substituting with fresh grape leaves, although it won't be quite the same. And Happy New Year to you too! Although similar in appearance, this is not the same leaf that is chewed. Was her mouth all stained? None of my grandparents chewed so I've only seen it when I was in VN. And no, I'm not exactly a mama's boy. I just like to come home once in a blue moon for a hot meal. What's the connection with docs and the Holiday Inn Express? I was referring to Holiday Inn Express commercials where people feel like they're more capable just because they stayed at the hotel. But let's see...if momentum is the product of mass (what you've got to offer ie. the proposal, some knowledge of science, and a sense of humor that amuses me) and velocity (how quickly you offered it ie. almost immediately after you discovered my blog!) but then you withdrew it all. So it's now inert ie. no momentum. Which, then goes to my previous point of you having to start all over again. :P Hehe. OMG I get brownie points for being a science freak? This world must be coming to an end!! I never try this leaf in Viet restauarnt here,next time I should open my eyes bigger looking at their menu. WC, yes, grandma's mouth was stained - plus she smoked those little cigarettes now and again. On another note, I visited your year-ago-post about Porto's in Glendale. Those guava/cream cheese strudels sometimes make their way to our office birthday breakfasts (co-worker who lives in Glendale) -- I agree with you, they're pretty good for breakfast! Whoa! Your grandma smoked too? How adventurous! I was finally able to get some la lot and I'll be making this dish today. Thanks so much for the recipe and all the info! I'll be looking forward to your post! My mom is famous for this we call its thit bo la lot though. Idk if that is different or not but it looks the same. We usually eat it with buon though. Yup, same dish. 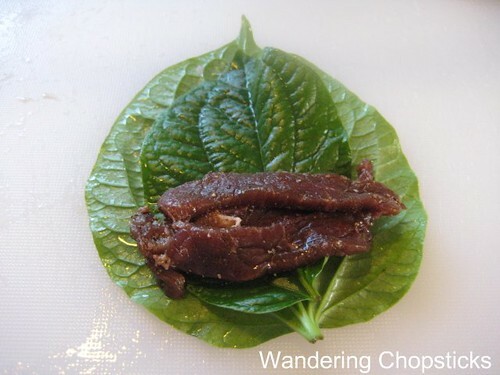 Bo (beef) la lot (wild betel leaf). I was so excited to try this recipe over the weekend, went to A Dong, and was sad to see they didn't have the La Lot. The cashier said it might be out of season. Do you have a specific grocery where you've seen them? Have you checked lately? They're definitely in season now. I know the San Gabriel Superstore and Asia Supermarket definitely have them. YES! Finally a recipe using these leaves, I am not from SE. Asia, but LOVE food, and always shop at the thai/viet markets near me. I have seen these leaves countless times, and always wonder what they are for. Will most definitely be making this dish. I love the fragrance la lot leaves impart on the grill. Just no other substitute.